The most famous devotional text produced on the eve of the Reformation was The Imitation of Christ, and the author most closely associated with it happens to be Thomas à Kempis. Though his authorship remains in question and the text is quite possibly a compilation of ideas about devotion that Kempis merely packaged for broader consumption, his name has nonetheless come to represent the distinctive brand of spirituality identified with the Devotio moderna movement that started with Geert Groote and later placed its stamp on Ignatius of Loyola, the Jesuits, and the Counter Reformation. There were numerous examples of disciplined, Christocentric piety in the late Middle Ages, but few would prove as popular and reproduced as that set out by Kempis in Imitatio Christi. The youngest of two sons born to a blacksmith and a schoolmistress in Kempen, along the Lower Rhine, Kempis was born Thomas Hemerken around 1379 or 1380, but took his surname from his hometown. He then received education at Deventer from 1392 until 1399 under the Brothers of the Common Life. The Brothers had continued promoting the disciplined lay piety articulated earlier by Geert Groote. Kempis’s own tutelage came under the care of Florentius Radewijns, who happened to be Groote’s successor. This education exposed Kempis at an early age to the devotional tenets that would shape his own later career. Though the Brothers of the Common Life were becoming increasingly more popular, they were not a monastic order by design, and thus open to the laity. On his deathbed, however, founder Geert Groote suggested to his followers that if they did in fact desire to take vows in an established religious order, they should join the Augustinian canons regular. A house at Windesheim became the first to do so and it served as a model for other Augustinian houses. In 1399, Kempis was admitted as a donatus to Agnietenberg (Mount St. Agnes), an Augustinian monastery associated with Windesheim. It just so happened that his older brother, Jan, had recently been named prior at the house. The younger Kempis took his time in the monastic formation process, though, as he was not invested as a novice until 1406, taking vows with the Augustinian canons regular in 1407. He was later ordained to the priesthood around 1413 or 1414. Little is known about his subsequent activities. Kempis spent the entire balance of his life in Agnietenberg. He served as subprior at the monastery at least twice, in 1425 and 1448. His influence there and abroad was felt through his writing, the most important contributions coming in relation to the Devotio moderna. He drafted a short history of the movement, Dialogus noviciorum. He left thirty sermons intended specifically for novices. He composed numerous other sermons, prayers, meditations, and hymns. He also wrote roughly twenty tracts. More significantly, however, he wrote short accounts of the lives of both Groote and Kempis’s own spiritual mentor, Radewijns. These vitae remain crucial sources for understanding the origins and development of the Brothers and Sisters of the Common Life and their distinct brand of devotion. While the identity of its author will never be entirely certain, the text laid out the deeply penitential, sacramental, Christocentric vision of spiritual contemplation and discipline originating with Geert Groote and shaping the Brothers and Sisters of the Common Life, the Augustinian Canons Regular of Windesheim, and the Devotio moderna. It has 800 extant copies dating from the fifteenth century, went through 2300 printed editions prior to 1800, and influenced Ignatius of Loyola deeply enough that he came to model much of his Spiritual Exercises after it. 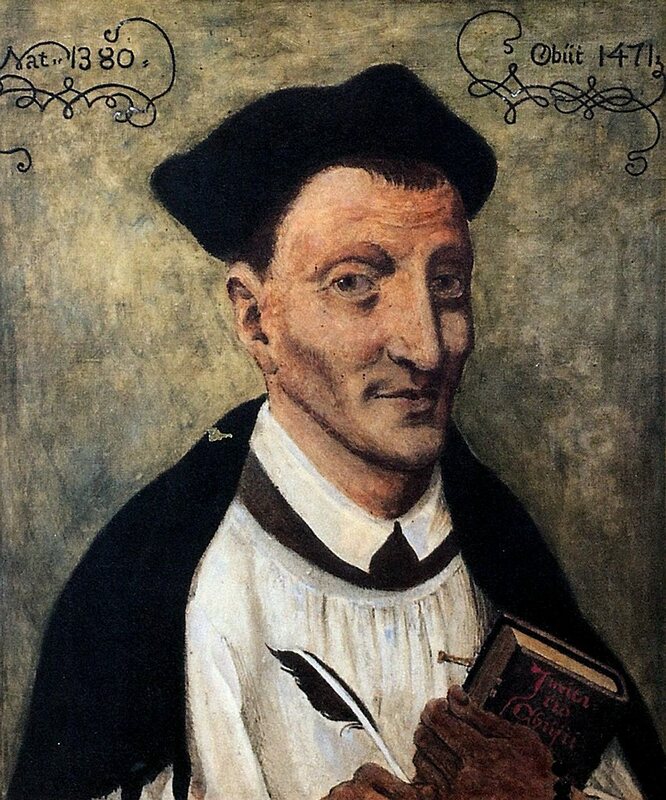 Thomas à Kempis died on July 25, 1471, in the monastery at Agnietenberg, where he spent the last seventy years of his life.